For many enthusiasts, and indeed display crews themselves, the season starts at Abingdon. Since the shows here were revived in 2000, the event has grown to become one of the most eagerly anticipated shows on the calendar - and not just because its arrival finally means the new season is here! Dan O'Hagan reports from Abingdon Airfield. Additional photography comes from Russell Collins and Dean West. 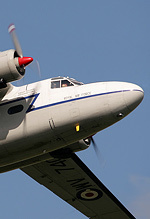 It's doubtful there'll be a better value display in 2011 than Abingdon's Air and Country Show. Where else, for a £13 on-the-day ticket could you see a display from Avro Vulcan XH558, a C-130J flypast from the Royal Air Force, and such a gem as the OV-10B Bronco albeit parked in the static? Add to that season debuts from this year's RAF solos, and a good helping of airshow favourites, not to mention plenty of ground-based attractions, and once again Neil Porter and his team had brewed up the heady mix that has made "Abbo" a must-do show for so many of us in recent years. And, despite grim midweek forecasts, the weather lent a hand too. Of course the Delta Lady was the headline act. At last there are signs that her operators have grasped the idea that the aircraft will only generate steady income by being seen, so unlike in previous seasons, she was ready for her displays at the very start of the airshow year. As for the display itself, there are no major changes to report. UKAR's observers didn't recall the sharp pitch-up on the B-axis prior to repositioning for the missed approach (which featured occasionally last season), but as usual the general public seemed thoroughly impressed with what they saw. The curving pass to open the routine was superb for the photographers. One criticism would be that the pull-up out of the missed approach was rather early, meaning those at the right hand end of the display line were left a little short-changed. Come on boys, keep her nice and low for as long as you can! 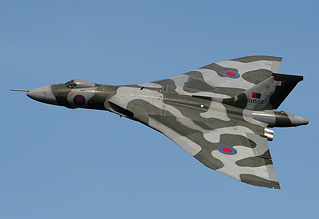 The Vulcan closed the show, but what had gone before was certainly not overshadowed by the big Delta. 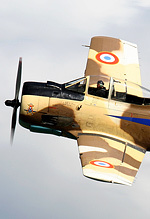 Arguably the display of the day was flown by Martin Willing in the North American T-28 Fennec. While the Fennec isn't the most nimble or agile of warbirds, this routine showed exactly how an aircraft could, and should be flown at an air display. Plenty of sweeping topside passes, making use of the whole crowdline, a missed approach with gear and flaps selected, some passes flown with display smoke, and some without. I doubt there was a single photographer at Abingdon this year who didn't come away with a memory card bulging with impressive shots of this aircraft. The crowd saw the first public displays from this season's three RAF trainer solos. The Tutor, flown by Flt Lt Shaun Kimberley, and Tucano in the hands of Flt Lt Dan Hayes seemed to be, as usual, precise and neat routines which appeared largely similar to previous years. The Hawk, this year displayed by Flt Lt Jules Fleming, was possibly the exception. The display, which will be watched more closely than ever given last year's trials and tribulations, certainly seems to have been revamped, and noticeably tightened, in that no longer does the jet spend much of the slot repositioning in the middle distance, although there are still no real opportunities for the photographers. Certainly on this evidence, Flt Lt Fleming can be pleased with her opening public display. Disappointingly neither the Hawk nor Tucano wore their display paint, and all three displays seemed notably higher and further away from the crowdline than many of the civilian displays. 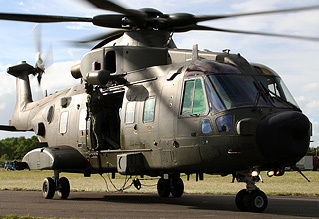 The RAF also supplied a C-130J Hercules for a single flypast, plus examples of Merlin and Puma helicopters in the static park. Dan Griffith threw a vintage Bucker Jungmeister around as if it were a Pitts Special - arguably one of the finest displays of this type in recent British display history - the only criticism being that only those at crowd centre got to see much of the routine. The Twister Duo of previous years, now Team SWIP, thanks to a sponsorship deal with Scottish Widows were impressively photogenic, especially in their close formation work. This year's display is an improvement on what we have seen from them before, and their aircraft have never been better turned-out than in their new livery. Other items included Abingdon favourites such as the Percival Pembroke, and Neil McCarthy's more-than-impressive demonstration of his Jet Provost T3, looking rather slick in a new paintscheme. Neil's display has come a long way since we saw him at Abingdon in 2009 - this year his was as good a "JP" display as we could remember. 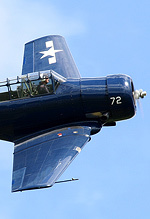 We also got to see a beautiful US-Navy marked North American Harvard (which, I guess makes it an SNJ), though this display was rather high and distant for some tastes. A show of this type wouldn't be complete without a parachute drop, and Abingdon featured the Army Tigers team, jumping from the back of a Shorts Skyvan, and Guy Westgate's glider routine was neatly flown, though would have benefitted from a little wingtip smoke. Cancellations included a pair of Spitfires from the Battle of Britain Memorial Flight, because of Coningsby crosswinds and technical issues ruled out The Ospreys display team. 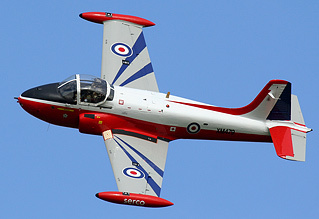 The Piston Provost was booked as a replacement for the Vampire Preservation Group's absent jet which was forced to cancel a few weeks in advance because of brake problems. In terms of the show organisation, despite more toilet blocks than previous years, there were still significant queues to use them and the usual "thunderboxes", meaning long queues for those caught short, and perhaps more seriously the lack of any apparent co-ordination of traffic getting off the showground, which at times meant four or five lanes of traffic formed, and tempers of some began to boil over, which is never a good end to the day. And whoever let the chap dressed as Biggles from Kidlington's "Fly To The Past" display hand out leaflets right at the front of the departing queues, further slowing things down made a serious error of judgement. To the experience Abingdon visitor the 2011 crowds looked more than healthy, with speculation of a record attendance. In any case it would appear that once again the organisers will be able to hand over a bumper cheque to the Thames Valley and Chiltern Air Ambulance, and that once again thousands of punters headed home having been richly entertained.